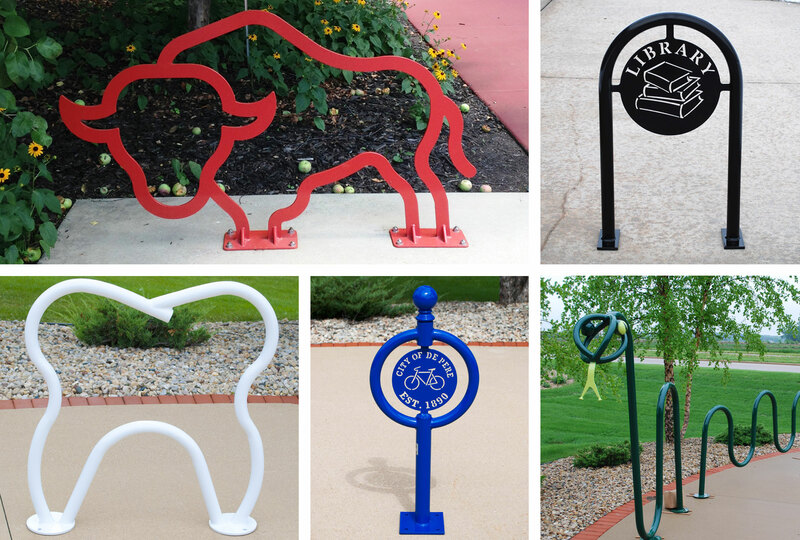 When you're looking to encourage a bike-friendly atmosphere, transform your environment and have a little fun, custom bike racks are the perfect answer to make your space stand out and support a bike-friendly community. Whether you're looking for something like our classic Highwheeler bike rack, the Orion bike rack with a modern touch, or the Advocate bike rack with a more overt nod to cycling and inspired by the Bike Federation's logo, the selection of bike racks is only limited by your creativity. A custom bike rack from Madrax will not only demand attention, but ensure style, functionality and durability last year after year. Feel confident knowing that an creative bike rack from Madrax means quality bike parking that reflects your vision. The best part, there's no cap on your creativity and vision. Check out our custom and branding design options for personalized creative racks that meet your exact needs. For more than 25 years we have set the standard for practical and custom bike racks. Located in Waunakee, Wisconsin, Madrax takes pride in our efficient ordering, local manufacturing, and speedy shipping processes that deliver your products right on time.